Leading culture change and innovation is a growing imperative for strategists, leaders, business architects and managers alike. Rapid changes, tighter budgets among other challenges are increasing the need for innovation. During this interactive session, your team will learn methods and thinking tools for developing a rapid innovation process and for building an innovation culture. Intervista relates emerging methodologies espoused by advanced innovation hubs and delivers these approaches conveniently to your team in an on-site 3-day interactive session. 1. Why Innovation? The future, faster. How do we do innovation? 2. Inspiration: Focusing on client outcomes. Who is the client: When is the user is not the client? The need for a common language. 6. Leading innovation: Creating a roadmap for the future. Contact us�about how to schedule this course on-site for teams of 12 or more. (5 to 9 participants: fee per participant). Large teams inquire for additional discount. 4 weeks prior to session date. Must be received one day prior to session. No participant will be admitted into the course without prior payment arrangement. Applicable taxes extra. All prices are in USD. *Promotional offers cannot be combined with our discounts. Credit card payment required at time of registration. Designated as a recognized educational institution, reference number 1145223385 for educational tax credits. Désigné comme établissement d'enseignement reconnu, numéro de référence 1145223385 pour les crédits d’impôt éducatifs. Group discounts do not apply for customized courses. Educational sessions scheduled outside continental United States and Canada are subject to a 20% surcharge on tuition fees. Cancellations are accepted up to two weeks prior to the course. A $100 service charge will be applied. Please obtain a cancellation number from us to confirm. Late cancellations will not be refunded, but enrollment fees may be credited to any future Intervista course, seminar or conference anywhere in North America. Substitutions may be made at any time. Intervista Institute reserves the right to postpone, cancel or change scheduled dates or venues, as well as the right to substitute instructors with other highly qualified experts. Participants that cannot attend a rescheduled course and have paid for the course, will be entitled to a full refund or credit for another course. To register for this course, complete our online registration form. 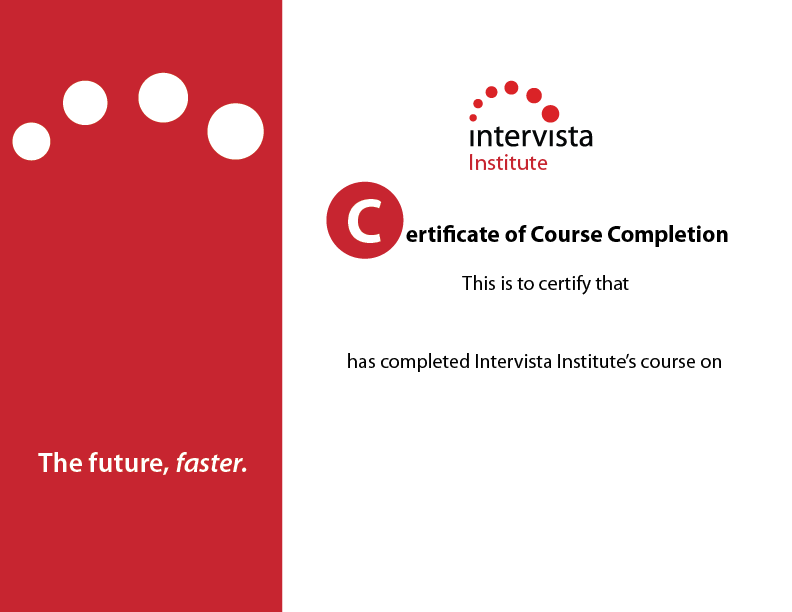 Certain professional associations may recognize Intervista courses for credit to satisfy your continuous education requirement. Present the course outline to your board for confirmation. This course provides approximately 21 hours of instruction for the 3-day session. Contact us about how to schedule this course on-site for teams of 12 or more. Each participant will receive a certificate of completion, hard copy of courseware and a notebook. Michael Lachapelle is a member of the Intervista faculty as well as a business design and transformation consultant with more than 12 years’ experience in both the corporate and public sectors. As course leader, he shares his expertise in business design and innovation, enterprise business analysis, business architecture, policy analysis and business model innovation. "I really am excited about taking the methodology back to the office…..and more excited to apply it. Excellent material and application, Instructor was extremely knowledgeable and experienced." "Very enjoyable and knowledgeable instructor. Particularly liked real world examples used as reference points." "I congratulate you on the high caliber of your speakers  they bring a wealth of knowledge to supplement the course material." "Very interesting and will be really useful in conversations with prospective clients." "Thanks to the presenter and team - Great stuff!"